Fantasy football can be a fickle lady at times. Sometimes you score the second most points in your league for a week and still lose, sometimes you leave a guy who scored 20 points on your bench because he hadn’t score more than 5 all year. And sometimes you lose your RB1, who you picked third overall, to a torn ACL and are left scrambling. Don’t worry! Prime Time Fantasy Football has you covered with not only some replacements for Jamaal Charles but for the byes and other injuries that will impact your team in week 6. Three listener questions this week – one each covering the quarterback, wide receiver and running back positions – so pay attention right from the start! There are also 14 games on the docket in week 6 for us to cover. Topics will include Ben Roethlisberger and Tyrod Taylor, the Dolphins situation with a new coach, and if the Eagles are finally, maybe starting to click. And don’t forget to tell me what you think of Prime Time Fantasy Football! Include your feedback in the comments section below and leave a rating on iTunes. Please don’t forget to leave a rating and review on iTunes! It takes a second and you can help Prime Time Fantasy Football increase our rankings with this simple gesture. Thank you for all the support! 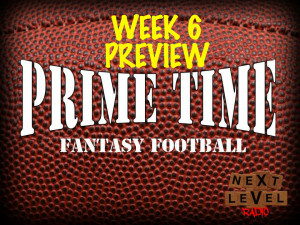 Connect With Prime Time Fantasy Football!